New approach realises Richard Feynman's famous remark that it would be very easy to make an analysis of any complicated chemical substance; all one would have to do would be to look at it and see where the atoms are"
The first ever detailed pictures of the structure of conjugated polymers have been produced by a research team led by Professor Giovanni Costantini at the University of Warwick. The ability of these polymers to conduct electricity makes them highly sought after, but until now they could also be described as extremely camera shy as there has been no easy means to determine their structure. The new technique allows researchers not only to determine it but to actually clearly see it with their own eyes. Conjugated polymers are able to conduct electricity because they are a chain of conjugated molecules where electrons can move freely due to their overlapping electron p-orbitals. Effectively, they are excellent molecular wires. Moreover, they are akin to semiconductor materials (they have energy gaps), so they can be used for electronic (plastic electronics) and photovoltaic (organic solar cells) applications. Modern functional polymers are often co-polymers, that is, they are made by an (ideally regular) sequence of different monomers. The order of these monomers is essential to their opto-electronic properties which can be severally damaged by errors in how the monomers actually link up in a chain to form the polymer (so called polymerisation errors occurring during the synthesis of these materials). However, detecting the nature and exact position of these errors has proved problematic with current analytical methods. Mass spectrometry does not provide a solution, as shorter polymer chains are typically more likely to be ionised and thus tend to be overrepresented in the spectra. Costantini and co-workers have proposed and implemented a completely novel approach to overcome this fundamental analytical problem. The underlying idea is extremely simple, yet at the same time transformative: deposit the polymers onto a surface and image them by high-resolution scanning tunnelling microscopy (STM). This approach effectively realises one of the visionary predictions by Richard Feynman's in his famous 1959 speech There's Plenty of Room at the Bottom, where he said that in the future "it would be very easy to make an analysis of any complicated chemical substance; all one would have to do would be to look at it and see where the atoms are". 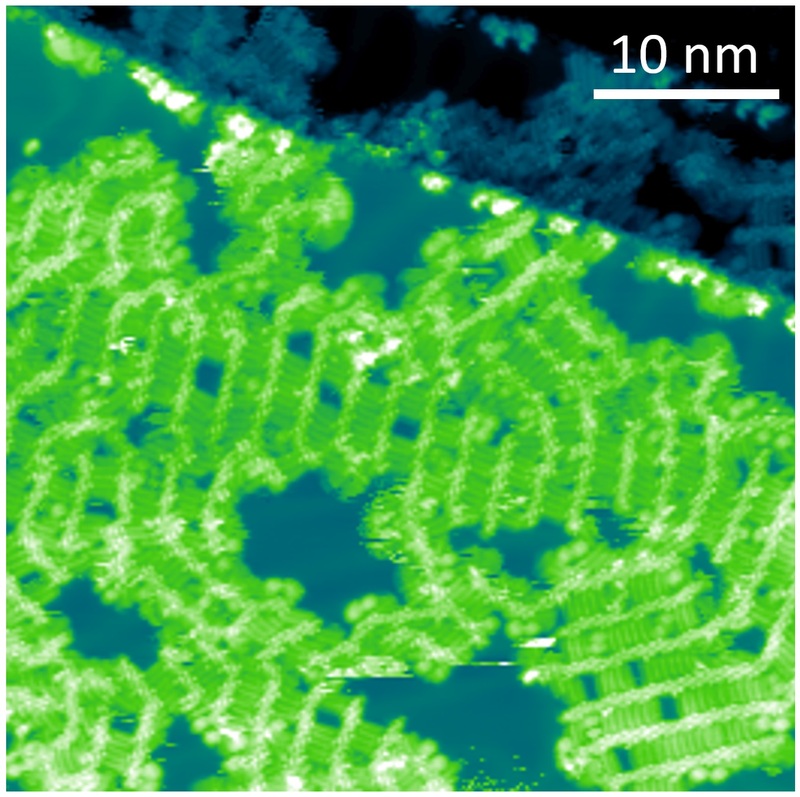 The atomic-scale resolution of STM is ideal for this aim but the problem remains that the chains of polymer molecules have first to be deposited intact in vacuum onto atomically clean and flat surfaces. The usual method of doing this involves heating the molecular material until it sublimes but, for molecules as large as polymers, this effectively melts the structure that should be studied. The authors have thus opted for a new method which sprays a cloud of the polymer through a series of tiny openings into a vacuum chamber, allowing a single unjumbled layer to be deposited onto a surface that is fully representative of the original polymer sample. 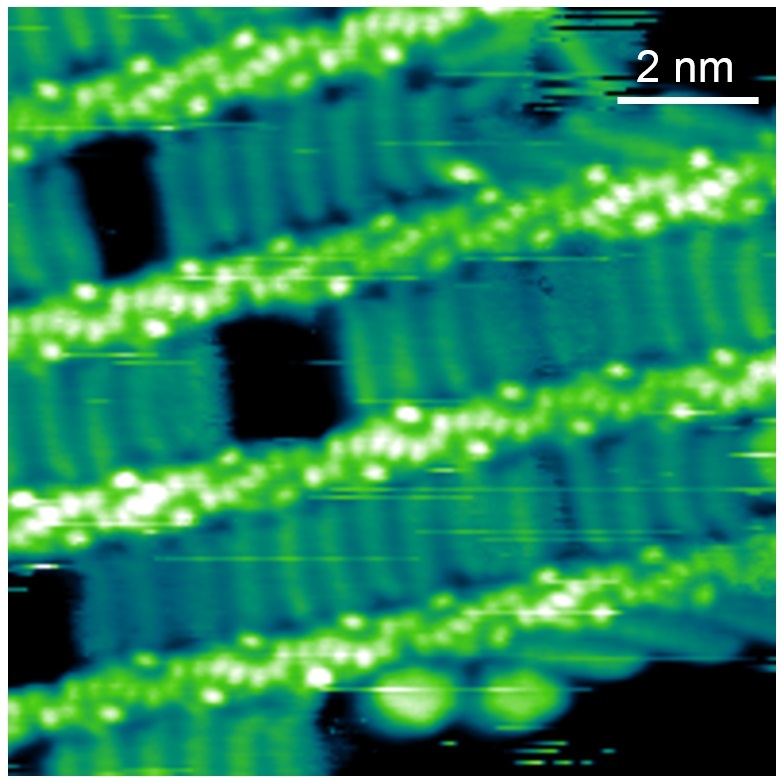 STM of these layers produced stunningly resolved pictures, clearly revealing sub-monomer details of the conjugated polymers. The researchers led by Professor Giovanni Costantini at the University of Warwick with colleagues from Imperial, Cambridge and Liverpool have published these results in a paper entitled "Sequencing conjugated polymers by eye" that appears in Science Advances today Friday 15th June 2018. Their high-resolution STM images of the structure of conjugated polymers are so detailed that they cannot only help with quality control and fine-tuning of polymer design, but they can even be used as something akin to an intellectual property (IP) passport photo for polymers. It is speculated that such precise and clear images could help synthetic researchers to demonstrate exactly the design they wish to legally protect by dramatically improving the information available to support an application for IP protection. In their paper, the researchers demonstrate the power of the new technique by examining the conjugated polymer: "Poly Tetradecyl-diketopyrrolopyrrole-furan-co-furan". This is a conjugated polymer of the DPP-based family that is currently showing some of the best performances in optoelectronic devices. This material is most effective when its polymer chains form in an alternating sequence of one large "A" monomer and a smaller "B" monomer. 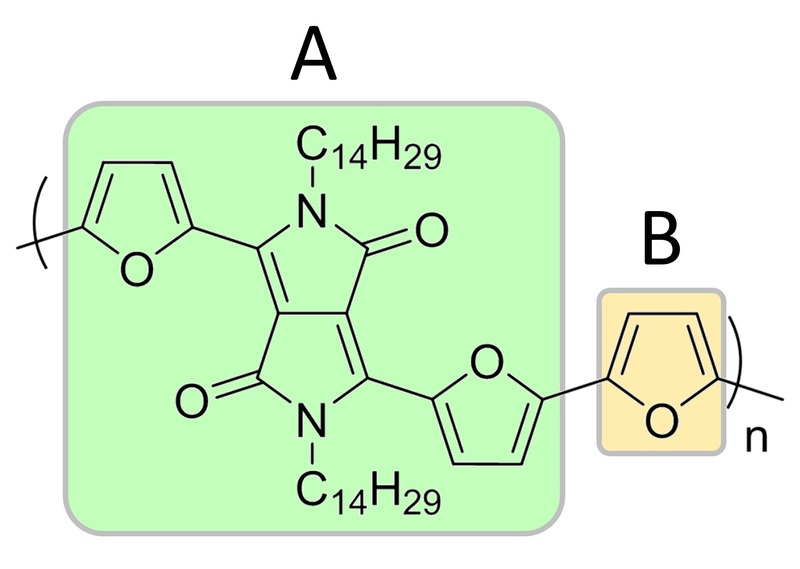 However, flaws can happen during the synthesis that break that ideal sequence, thereby also damaging its appealing conducting and light-harvesting properties. The speculations so far were that this mainly occurs when two of the larger "A" monomers join directly together in an BAAB sequence. When these flaws happen, gaps or voids form in the conjugated polymer's assembly in correspondence to those errors in the chain. The University of Warwick led research team was able to use their new visualisation technique to very clearly show all of these gaps and then to zoom in further onto the polymer chains, precisely spotting each of the defective monomer sequences. On doing so, to their great surprise, they found not the expected BAAB flaws but ABBA defects. This new capability to image conjugated polymers with sub-monomeric spatial resolution, allow us, for the first time, to sequence a polymeric material by simply looking at it. Some of the first images we produced using this technique were so detailed that when the researchers who synthesised the polymers first saw them, their overjoyed impression reminded me of how new parents react to the first ultrasound scans of their babies. Besides representing a significant technical breakthrough, this new technique of combining vacuum electrospray deposition with high-resolution scanning tunnelling microscopy also has the potential to revolutionise the analytical capabilities in the application-relevant field of conjugated polymers where other currently available techniques are extremely limited. 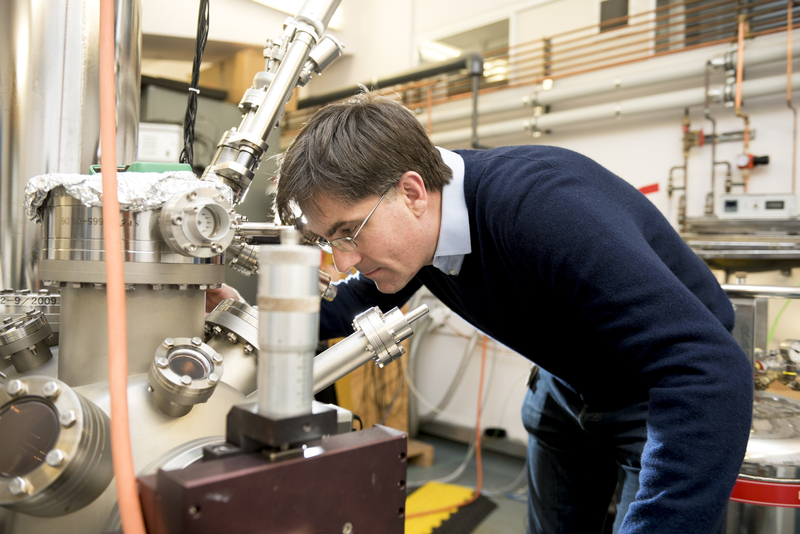 I am particularly grateful to the University of Warwick which directly funded that the purchase of the electrospray deposition equipment that was crucial to making this significant technical breakthrough. The research was led by Professor Giovanni Costantini form the department of Chemistry at the University of Warwick. 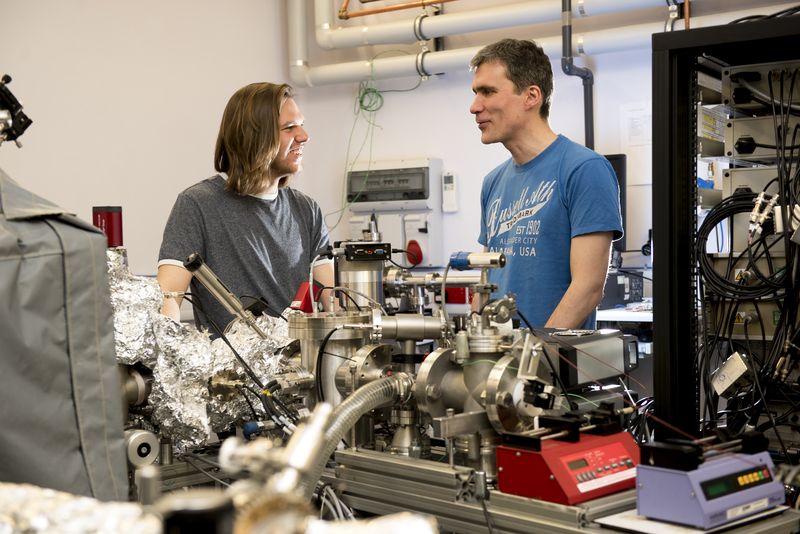 The other authors on the paper were Daniel A. Warr, Luís M. A. Perdigão, Harry Pinfold, and Jonathan Blohm all from the University of Warwick; David Stringer from Imperial College London; Anastasia Leventis and Hugo Bronstein from Cambridge, and Alessandro Troisi from the University of Liverpool.